by design. 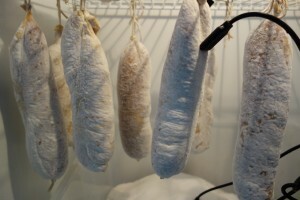 I sprayed the surface of these sausages with mold starter, and thought that keeping the fridge humidity (or water activity) really high would give the mold spores the environment they needed to do their thing. The humidity/water activity in the fridge appears to be 95%/0.95aw. This is by far the most successful mold hatching I’ve had, so I’m probably a little too excited about it. We had bad mold (black, green, fuzzy) show up on the first sausage-making attempt. 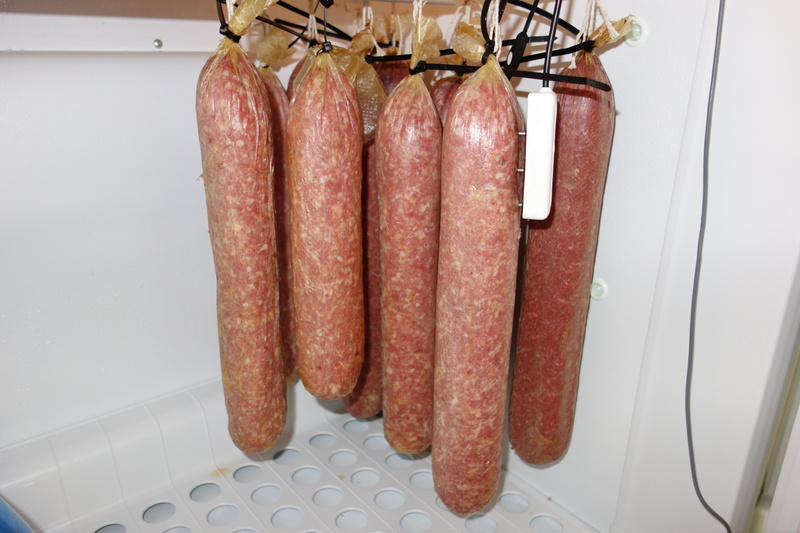 In retrospect, conditions were no different than they are right now in the fridge, but we hadn’t put mold starter on the surface of the sausages back then. Our successful mold growing shows that the trick is getting the good mold to out-compete the bad mold, rather than hold a fridge water activity so low that nothing can grow (probably below 0.7 water activity, or 70% humidity). 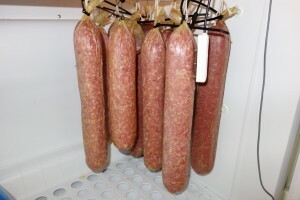 On Friday, I also made up two more batches of sausage: soppressata, and peperone. These I stuffed into dried hog casing, which made me wonder why I bother with the gross and rather rank hog casings. They even look better, if a bit “standardized”. The soppressata is to the left, with the darker peperone to the right. You can see the stick in the foreground that has the soil moisture sensor in it – I’ll be taking dry-down readings on this too, as well as readings on the moldy tuscan salami (you can see the smaller black cable of another sensor sticking out of one of the sausages in the pic at the top of this post). The prosciutto appears to be coming along nicely – more on that later.